Maps are an important part of the ephemera of the RASRL Collection. The maps were, as far as we know, created by students to accompany research papers. Sometimes there is a map with no paper; sometimes there is a paper with no map. Standing alone, then, they require interpretation and invite speculation about what they are, why they exist, what questions they were meant to answer, and how those answers reflect the agenda, pedagogy, or theories of the sociology faculty. A favorite map is this one created by a student named Mondo Minami. In this case we have the paper and a map that allows us access to Minami’s thinking, the assignment and perhaps something about his background. The paper, “Survey of Kahuku as a Plantation Community,” is a typical RASRL community study. Minami described the basic features of the town – its geographic location, natural features, location of segregated ethnic camps that housed the sugar plantation workers. He analyzed the community by describing important institutions such as schools, churches, and the local hospital. The RASRL Collection contains many community studies of plantation towns and there a number of maps but few are as well preserved as Minami’s. The map is eighty-six years old but it retains some of the original vividness. The map is exceptionally neat. Everything is perfectly aligned, the labels large enough to read. There are no smudges, no erasures, no obvious mistakes. What do we know from examining this map? It helps us to visualize some of the features that most plantation towns had in common. Plantation workers always lived in camps that were segregated by ethnic groups. The maps also showed the location of schools and churches. Minami shows us the “English” school, run by the Department of Public Instruction, and the “Japanese” school, privately owned and operated by the Japanese community. Since Kahuku had its own mill the map shows the structures that made it possible to grow, harvest, and process sugar in one location. There are features of the map that are unusual. Minami included the “White District,” which is, appropriately, on the other side of the tracks from the rest of the town. Their neighborhood seems to stretch beyond the borders of the map, reminding the viewer of the dominant Haole community whose presence is understood but not always acknowledged in RASRL community studies. 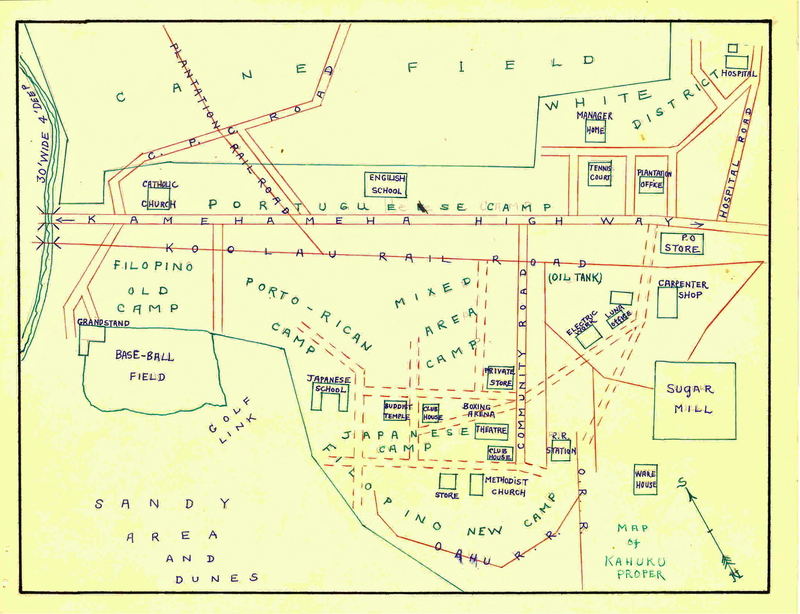 Anyone looking at this map in 1930 would recognize it – many of the RASRL writers would have had intimate knowledge of life on a plantation and may have had reason to critique Minami’s rendition. But from a distance of eighty-six years our vision is blurred. This sugar mill went out of business in 1971, which makes Minami’s map obsolete. It is now possible for visitors to take a tour of the town on their way to visit well known surf spots on the North Shore of O‘ahu. Other features on the map, the Catholic Church and the public school are new facilities but in roughly the same locations. What’s outside the frame? Maps can be a literal representation but they can also be seen as imaginative renderings of space and time. The map freezes us in a single moment. Any primary source does this. The front page of a newspaper, a letter or diary entry gives us access to a past moment, but not necessarily the place where that moment happened. We can take Minami’s map, an artifact from the past, to the same location and experience past and present as layers of reality. And just beyond our field of vision is Minami himself. Minami did more than just fill in the relevant features of a pre-existing map. He had “body knowledge” of the neighborhood. He moved around Kahuku, talked to people, gathered, and recorded details. Although the RASRL maps are highly personal, idiosyncratic, perhaps inaccurate in some ways, they may contain truth that is no longer accessible to us because it lies beyond what we can see.